There are plenty of decent gambling movies. It’s a natural subject for offering conflict and drama, winners and losers. Most follow well-established structural rules that take in mentors and apprentices, arch-nemeses and addicted best pals. It should actually be surprising if you are unable to eke a certain amount of tension from any given scenario, be it pool or cards; there’s an ever bountiful fountain of slow-burning tension on tap, as the protagonist dutifully gets in over their head. Writers Brian Koppleman and David Levien managed it with Rounders, a patchy affair that sagged under the weight of its clichés but ultimately won through on the strength of its casting. 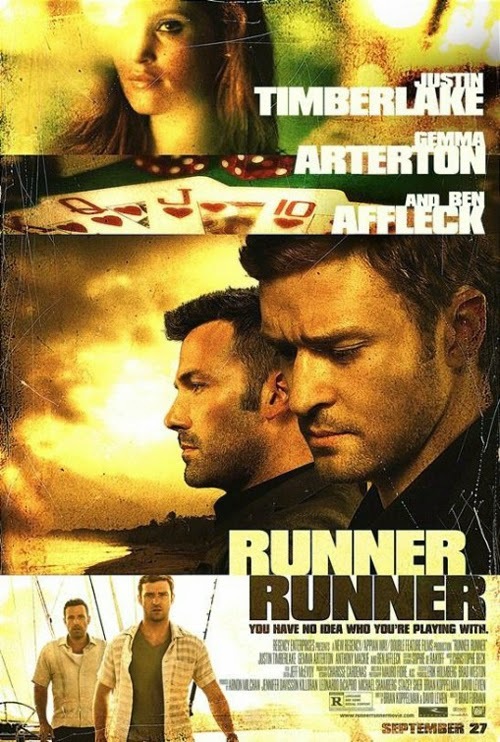 Runner Runner has no such luck. Justin Timberlake is, at best, a passable screen presence, in that he’s been okay in a few things where he was either musically inclined (Inside Llewyn Davis) or the object of derision (Bad Teacher). But he isn’t a reliable dramatic presence (he was the weak link in the otherwise very good The Social Network), and he’s very far from being a movie star. Aside from his lack of chops, his screen presence is lacklustre; naturally unsympathetic and a bearing a vague untrustworthiness. It might be those pointy eyes. Perhaps Brad Furman and his casting directors were subconsciously conscious of this, and thought he’d be perfect for Richie Furst (this movie has awful character names; they might work if it was a comedy), the morally suspect Princeton masters student who runs a scam to get undergraduates to sign up to online gambling websites (the opening credits informing us of the wash of student gambling addictions is as close the picture comes to relevance, despite repeated attempts to summon the spectre of the global financial crisis). Richie used to have a Wall Street career, so he’s straightaway one of the enemy, and when he is danger of being expelled for non-payment of fees he risks everything in an online poker game. And loses. But wait a minute; he could tell the game was rigged. Because he’s brainy. So Richie sets off to Costa Rica to confront the owner of Midnight Black (the website), one Ivan Block (Ben Affleck). Yes, Ivan Block. Good grief. So Timberlake is the Charlie Sheen to Affleck’s… Michael Douglas (his dialogue is very much sub-Gordon Gecko ruthless). Credit to Ben for attempting to ascend to the summit of the elder supporting man/villain, but he never really nailed the leading roles to start with. The result is two listless performances at the centre of the picture. Timberlake, twitchy and nasal, is in thrall to Big Beefy Ben. Who seems to have decided a rash of stubble will make do for characterisation (this is definitely one where he’s acting with his lantern jaw). I don’t mind Affleck per se, but whenever he’s onscreen I can’t help but instantly think there’s someone better they could have cast. There’s a blunt, dulled quality to him. Bringing up the rear is poor Gemma Arterton in the PA/girlfriend part of Rebecca (we’re told she built this business with Ivan, but neither she nor the script is selling the idea). Still Gemma got a free tan out of it, so it’s not all bad. John Heard, as Richie’s dad, has about two scenes. He got off lightly. Richie has his foot in the door and succumbs to Ivan’s offer of an “in” on his flashy lifestyle. So we run through the standard plays of seduction (money and girls), intimations of dodgy dealings (Anthony Mackie as an FBI agent attempting to secure Richie’s services) and finally disillusionment as the devil’s dealings are revealed in full. It’s not necessarily what you do with this kind of movie, it’s the way that you do it. And director Brad Furman is all at sea, with only Mauro Fiore’s burnished photography of Puerto Rico (doubling) to stamp any personality on the proceedings. If there was any snappy patter in here it’s buried by the faint performers. There are references to Ponzi schemes, to underline Block’s nefariousness, but we understood he was actually a wannabe Bond villain as soon as we were introduced to his pet crocodiles. Richie’s eventual discovery of a conscience (that voice in his head is not fear, it’s his conscience; they liked the line so much, they used it twice!) is largely unconvincing because Timberlake is unable to convey genuine penitence (he’s also rewarded for his vague good deeds, par for the course in this sort of thing but uncomfortable when the lead fails to garner sympathy). The worst thing about a scam movie is for the scam to leave you shrugging, and nothing in the final act twists leaves any impression. Firstly because we don’t give a hoot about anyone here, and a secondly because the intrigues are so incredibly weak they barely register. I wasn’t terribly convinced by Brad Furman’s last film, The Lincoln Lawyer. It may have been instrumental in Matthew McConaughey’s career comeback, and it possessed a decent enough script, but Furman seemed to do everything he could to work against its dramatic potential. He’s more pedestrian in his approach here, but no more successful in securing our interest. As for the leads, it will be interesting to see whether David Fincher can elicit an acceptable Affleck turn with the upcoming Gone Girl. He generally has a sure touch, but he isn’t infallible (Timberlake, Jake Gyllenhaal). Timberlake, well it’s hard to see him eking out a reputable career as a muso-turned-actor on the level of, say Wahlberg. Casting youthful-ish leads in this kind of morality tale, who lack substance, brings to mind the late ‘80s-early ‘90s trend for Brat Packers in iconic roles. Those were probably more misses than hits (Mobsters) but invariably there was someone with some genuine charisma in the line up (Emilio Estevez, for example). Runner Runner is sunk by a tired script, indifferently directed and performed gracelessly by bland leads.